All Saints’ Church is a remarkable building in Bristol, being an ingenious reworking of a major church of 1868 designed by architect George Edmund Street which was devastated by incendiary bombs in December 1940. Carried out by Robert Potter, the reworked church consecrated in 1967 blended sympathetic conservation of surviving sections of Street’s original fabric, namely the narthex, tower and sacristy, with a strikingly modernist statement. The new building was cutting edge in terms of its form, furnishings and liturgy. 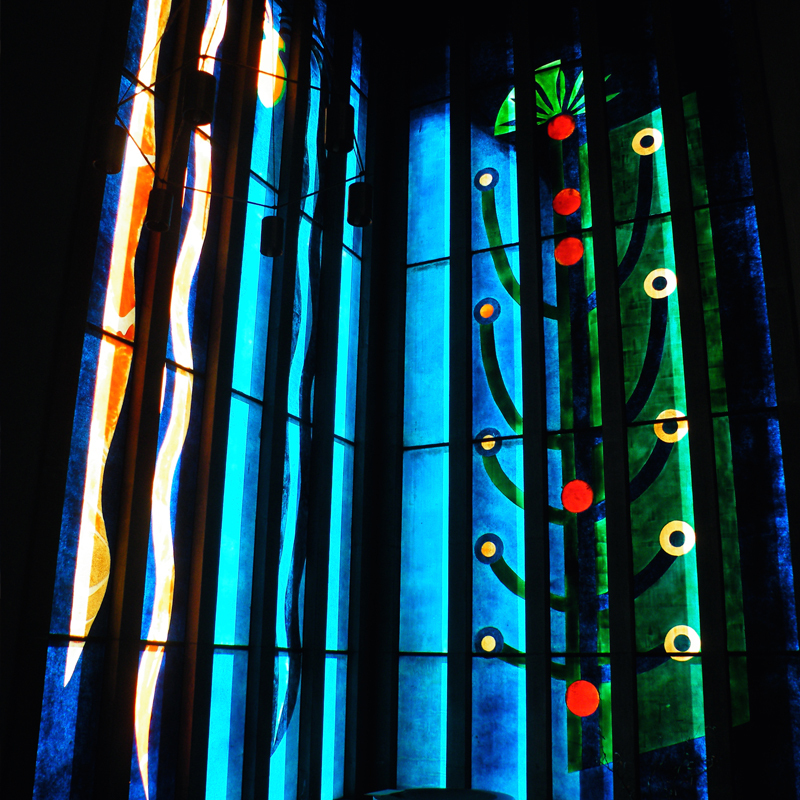 John Piper’s ‘stained glass’ panels formed from fibreglass and polyester are one of the most surprising elements of the building. Externally there is no hint of the exciting explosion of colour and mood these windows give to the interior. The translucent fibreglass panels produced by Piper are an integral part of the architectural design. 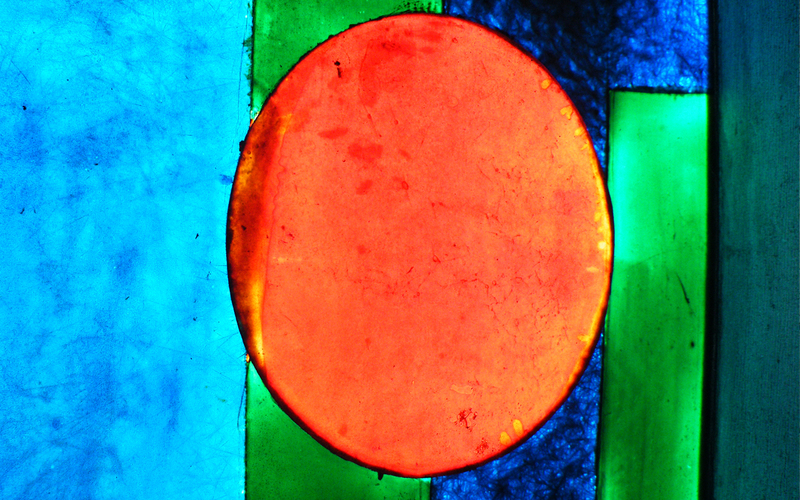 It has been suggested that they were a cheaper alternative to traditional stained glass, but they are in fact strong statements by Piper, who was clearly excited by the medium and by the exchange of ideas the project afforded with other artists at the Royal College of Art also experimenting with the material in the 1960s. The traces of Piper’s pencil under-drawing are free and gestural, suggesting a sense of freedom difficult to attain within the restraints of traditional stained glass technique. It can be argued that the church is greatly under-valued architecturally, and is in fact part of the same energy and flowering which produced the great masterpiece of the post-war period, the new cathedral at Coventry. The Piper-glazed panels are correspondingly underpublicised for what they certainly are: a nationally important work of art, typical of the period. The scope of the project: It was acknowledged during early discussions that the unusual nature of the material demanded the involvement of not only a stained glass conservator with an understanding of how windows fit into buildings, and an appreciation of fine art, but would require the expertise of a specialist who understood the conservation problems inherent in fiberglass and polyester works of art. We were fortunate to work in collaboration with Dr Yvonne Shashoua, senior researcher in the Department of Conservation at the National Museum of Denmark, where she researches the degradation and conservation of plastics objects and artworks. Dr Shashoua agreed to undertake analysis of the fiberglass panels and her excellent report (produced July 2015) was essential in informing the conservation process. The conclusions confirmed that the protection of the surviving fiberglass panels from harmful UV radiation and from the effects of water ingress were essential. A methodology and specification for this work has been prepared and works to two test lights commenced in November 2018. The conservation work can be seen as one element in a wider process of publicity and education, raising the public profile of this extraordinary building, and of John Piper’s work as a vital part of it. Outreach and interpretation: Organizations such as the National Trust now routinely provide public access to major conservation projects, providing a valuable educational and cultural resource to their members and the wider public. The conservation process is made available through the media, both on and offline. The use of digital time-lapse photography, and film, allows unprecedented public access to site works and studio elements of the conservation process. The conservation works at Clifton will also provide an excellent vehicle for the production of printed material for the use of the church in better publicising its considerable cultural assets. 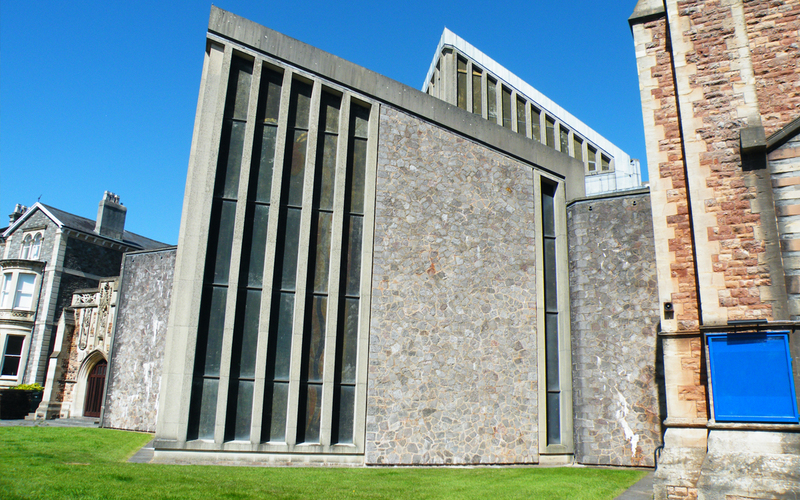 The form of the church, with spacious linking corridors also lends itself to exhibitions – both temporary and permanent – which will explore the development of the building and of the wider architectural development of churches during the 1960s which embraced the Modernist movement. A critical appraisal of John Piper’s contribution to this movement, embodied in this work at All Saints, Clifton, is being prepared by art historian Martin Harrison.